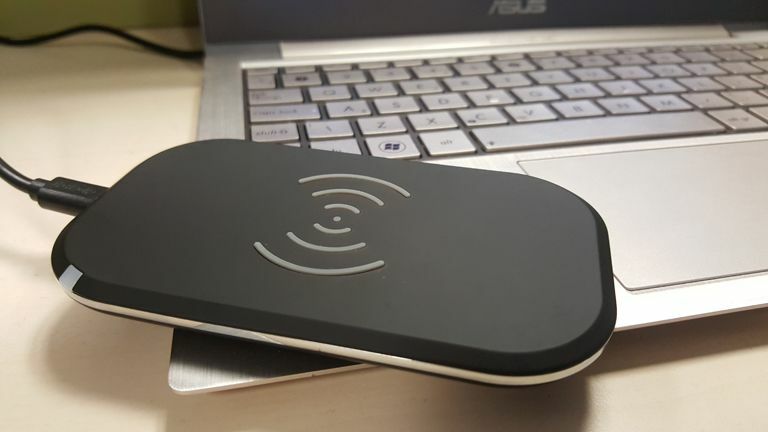 Is this competitor to Samsung's official Wireless Charging Pad worth a look? Wireless charging pads are about convenience, right? Fundamentally their branding misleads, as they are far from wireless. They just move the wire. The thing is though, the fact that these products aren't really wireless doesn't matter as they are primarily about convenience. They are about saving you time and effort on a daily basis, scraping seconds off that plugging in experience and making it fractionally easier, allowing you to drop your phone on a flat surface, rather than, say, bending down to plug the device into the wall. They are small differences in action, but when you repeat them thousands of times in a product's lifespan they add up. Without drinking too much kool-aid, after some considerable usage of wireless charging pads over 2015, I think they are in fact a product worthy of attention. Yes, the argument that they aren't necessary remains 100 per cent bulletproof, however I don't think that line of thinking is actually very helpful in terms of evaluating a charger as a product. After all, the vast majority of technology is non-essential. Just because you've got a pair of headphones doesn't stop you buying a pair that are more comfortable, or a pair that delivers better audio fidelity. The current wave of wireless chargers should be judged, primarily, on whether they make the charging experience better, not whether or not they are an essential product. Which brings us round to the 3 Coils Fast Wireless Charger from Choetech. Designed primarily for use with the Samsung Galaxy S6 Edge Plus and Galaxy Note 5, although compatible with any Qi-enabled device, this 3rd party charger sits roughly at the same price point right now as Samsung's own Qi Wireless Charger Pad. Simply put, it is clearly designed as a competitor to the official product and for the remainder of this review that's exactly how it's treated. So what do you get? The charger comes packaged in a standard cardboard box with white, outward sleeve. Remove the sleeve and the plain cardboard box awaits, its contents accessed through a top-opening hinged flap. Inside you are greeted with the charging pad and a micro USB to USB cable. There is no AC power plug. A simple 'contact Choetech' leaflet completes the package. The charger itself measures in at 120x70x10.6 mm, weighs 6.4 ounces and is connected to your device of choice via the included micro USB to USB cable, which itself measures one metre in length. The charger is rectangular in shape, however has curved and tapered corners, making it resemble a small form factor Android smartphone. Its base is made from smooth black plastic, while its surface is made from rubberised plastic composite, the two sections split by a band of shiny silver metal that encircles the charger's rim. In the top-left or bottom-right corner depending on your orientation sits the charger's indicator light. This small square light illuminates blue when the 3 Coils is charging a device; when it isn't it remains off. The micro USB input port is located on the on the top or bottom end of the device, again depending on user orientation. Finally, in the centre of the surface's rubberised charging area, the three internal charging coils are expressed by a series of ridges, which help the user identify the core of the charging platform. For testing, we powered the 3 Coils off an Asus Ux21 Ultra Slim laptop via USB, however there is no reason why you couldn't connect the 3 Coils to a USB power plug if you so desired. As the 3 Coils' main selling point is its fast charge capability with the S6 Edge Plus and Note 5, the first thing we evaluated was whether or not 'fast' actually meant fast. After placing the Edge Plus onto the charging pad - we'll get to that in a minute - numerous times, we can confirm that the 3 Coils does charge the device fast, with the charge time noticeably quicker than other standard speed chargers. We couldn't, from some casual testing, differentiate it from Samsung's official fast charger in speed however and we're guessing that if there is a difference then it's negligible. So with the core fast charging functionality confirmed we moved onto evaluating the 3 Coils' general design. Firstly, you can place a device onto the pad both vertically and horizontally and achieve a charge connection. Equally, we dropped the phone onto the charge pad at a number of off-90 degree angles and, while there were the odd times when a connection wasn't made, the vast majority of the time there was no issue. This is good as one of the biggest issues we've seen so far with some wireless charging pads is how finicky they can be about device orientation. The device's centre does however have to be more or less aligned with the centre of the charging pad, however thanks to the very obvious raised ridges on the rubberised charging surface, this was not an issue. In terms of basic aesthetics the 3 Coils looks pretty sleek, feels light but well made and has zero branding on it asides from on the unseen rear plastic. This, along with its simple black and chrome colour scheme, gives it an understated presence on the desk. The metre-long micro USB to USB cable also feels well made. One thing that stood out though during testing was the fact that when the S6 Edge Plus was positioned onto the charge pad, the blue indicator light kind of became redundant unless you were viewing the charging platform from a low orientation. This was simply due to its engorged form factor, with the phone's body totally covering the 3 Coils. This isn't an issue per say, as the phone always throws up its little 'I'm wirelessly charging' animation when a connection is made, but should be mentioned. Overall then the 3 Coils Fast Wireless Charger is yet another entrant in this rapidly growing market, however it is a good one, offering the same performance as the official Samsung product but in a different and, in our eyes, sleeker form factor. Whether or not you prefer the 3 Coils' rectangular design or the circular one that Samsung offers is only something that you can decide. Crucially though, the charger makes charging Qi-enabled devices slightly easier on a daily basis, specifically if you own an S6 Edge Plus or Note 5 due to the fast charge capability.